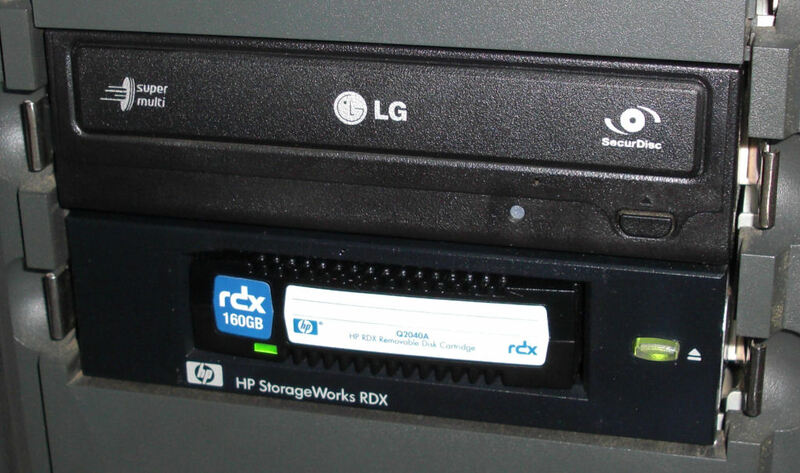 In the beginning of 2010 I have searched for a better solution for my own data backup and eventually decided to use “RDX”. RDX is the abbrevation for “removable disc exchange”. It is a system with very robust cartridges containing 2.5″ harddiscs. The system was already developed in 2004 by ProStor. Meanwhile drives and media are also offered by Tandberg Data, HP and Imation. These manufactures affiliated to the “rdx storage alliance”. On the first look one could presume that it is only an expensive bay for harddiscs. But actually the drive contains a controller which presents itself to the operating system as a removable drive and a motor for ejecting the cartridges. The external USB version also comes with it’s own separate power supply. I decided to use the internal USB version by HP since SATA removable drives are not supported by every system or SATA controller without any problems and the speed of USB is totally sufficient for backups. 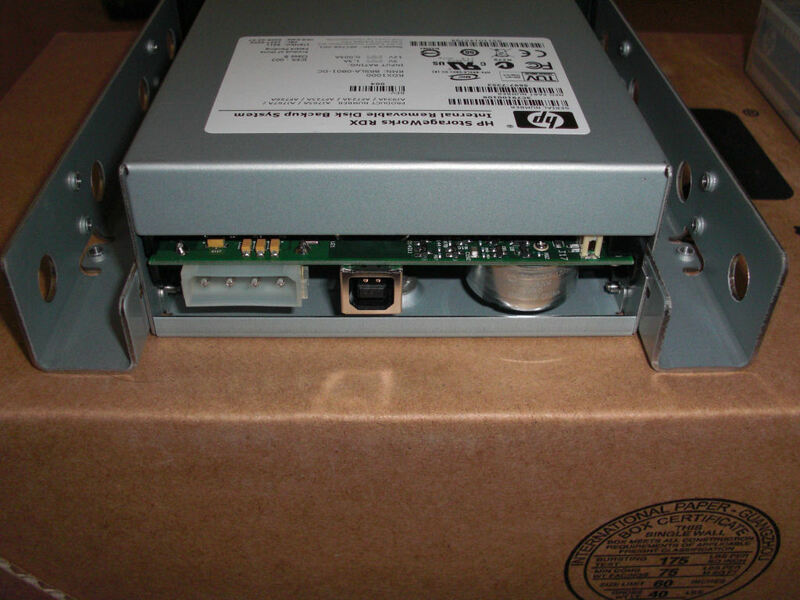 It will be mounted to a free 5.25″ bay. Included in shipment there are three cables for the USB connection depending if you want to use a regular USB jack or one of two types of internal connectors on the mainboard. Therefore the internal connection on an Asus P5Q was no problem at all. On the following pictures you can see the connections (power supply, USB) and in the right area the motor for the cartridge eject very well. The drive will be recognized as an USB mass storage device in the BIOS as well as in Windows XP or Ubuntu Linux 9.10. Therefore there are no special drivers neccessary to use it. It is also possible to eject the media using the respective funtions of the operating system. If neccessary, there is also an emergency eject – similar to optical drives – through a small hole where you can eject cartridges mechanically using a paper clip or the like. The eject button on the drive may only work if a special service is installed in the operating system. See more below. Since in the cartridges regular 2.5″ SATA harddiscs are used, the capacity is only limited by the current state of harddisc technology. The drives themself have no specific capacity limit. Currently (beginning of 2010) there are models offered with up to 750 GB. In the drive of HP the second media by Tandberg Data also worked without problems. 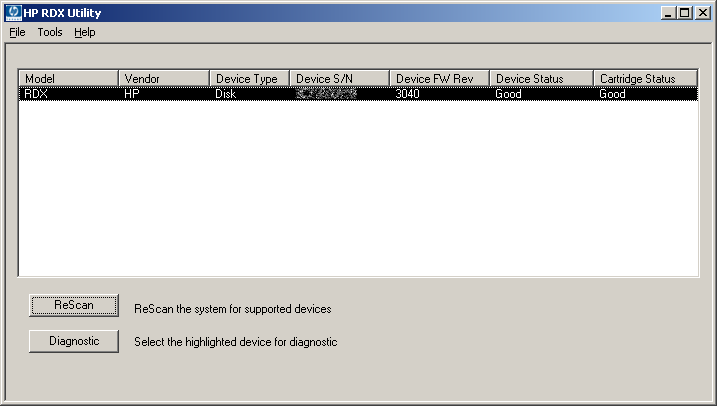 The mounted harddiscs use a modified firmware so you can not use them directly with a conventional SATA controller. It is also not possible to mount a harddisc with a higher capacity into an existing cartridge. As already mentioned in the beginning, the cartridges are build very robust. The harddiscs are mounted in special rubber frames and withstand a drop from 1 meter to a solid ground without any damage, as stated by the manufacturer. The 160 GB media, which where used, are shipped preformatted with NTFS. For the usage with Linux it is no problem to change this to ext3 or the like, since you can use the regular functions of the operating system to format the media. The speed is about 27 MB/s when reading and bit less when writing data, which is totally sufficient for backups. The electrical connection is done using the SATA connectors of the harddiscs, where doubts arise about the durability. However, the manufacturer declares a life span of 5000 media changes for the cartridge, which lasts for more than 10 years, even when changing the cartridges on a daily basis. This is probably be accomplished by using a connector in the drive, which needs less force than regular (e)SATA cables and using the motor to eject the cartridge, so connecting and disconnecting is much more gentle than manual SATA connections. Another advantage to more simple disc bays: The cartridges have a write protect switch, which avoids unintentional deletion or overwriting of data. Even when the RDX drives are generally useable without drivers, at least for the correct function of the the eject button on the drive a system service is needed, which monitors this button and triggers the eject of the cartridge if neccessary. This service – “RDXMon” – is unfortunately only offered for Windows at the moment. Together with this service also the “RDX Utility” will be installed, which allows to check the current state of the drive or to update the firmware. 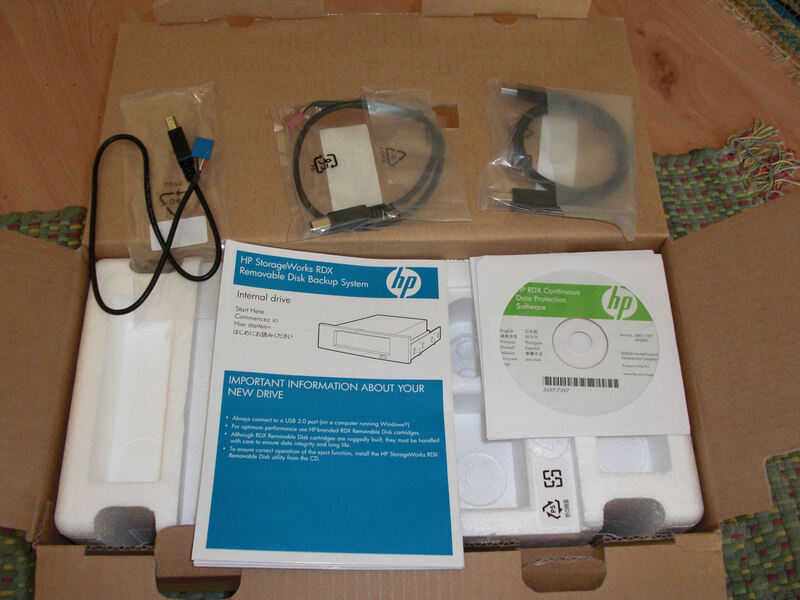 Additionally HP also ships a backup software, which can also be downloaded for free. The special about this software is, that cartridges are recognized when inserting them and the backup jobs, which where defined for them, are executed automatically, if you want this. Also the catalog of all backed up files can be browsed offline – it is shown as a virtual drive. When you want to open a file or copy it back, the software prompts to insert the appriopriate cartridge. This procedure reminds to the software “Echo 1 Safe”, which was used with the ADR streamers by Onstream. Personally I don’t use this software, since I have my own backup procedures using disc images for the system partitions plus rsync and robocopy for data – thereby not all data is copied completely every time, but only the changed files are copied, which often takes only a couple of minutes after the first backup. For the practical usage the “RDX Compatibility Guide” (which can be found at http://www.tandbergdata.com/default/assets/File/PDFs/RDX_Compatibility_Guide_1.15.pdf or via the web links at Tandberg Data) is very helpful – you find pratical specifications about the compatibility to soft- and hardware from a number of vendors, also concerning the SATA version. Build in to a 5.25″ bay the drive looks like a streamer and the handling is not very different. However it is nearly silent, since there are no cooling fans and the 2.5″ harddisc in the cartridge is also very quiet. Additionally the whole bay is mounted on rubber bumps to damp vibrations. Even though the purchase price for the drive and media is quite high compared to the capacity, the system convinced me because of the totally trouble free handling. The previously used harddiscs in a regular SATA drive bay where cheaper and faster, but reliable media changes without the need of restarting the PC completely where more a matter of luck and the harddiscs had to be handled like raw eggs. For small companies, freelancers or ambitious private users, who do not need to backup data with an amount of several terabytes, RDX with its easy handling is a very interesting alternative to streamers or external harddiscs. Also the factor, that this systems is already offered for many years and is still supported (the last firmware update as of beginning of 2010 was in april 2009), makes it more trustworthy than some other, proprietary developments, like ADR or REV, which all existed on the market just for a couple of years. Update April 2012: Meanwhile I use media with a capacity of 500 GB each and the drives are also available with USB 3.0. But the drive and the 160 GB media, which I have purchased in the beginning are still blameless and the new media work in the old drive without problems. Update November 2014: Drive and media still work flawless and are still available in the market. Update March 2016: Meanwhile you get media with a capacity of up to 2 TB and there are also versions with SSD or WORM media. By the end of 2014 I had the opportunity to test the 160 GB media with the SATA version by Tandberg Data, which is about 50% faster. 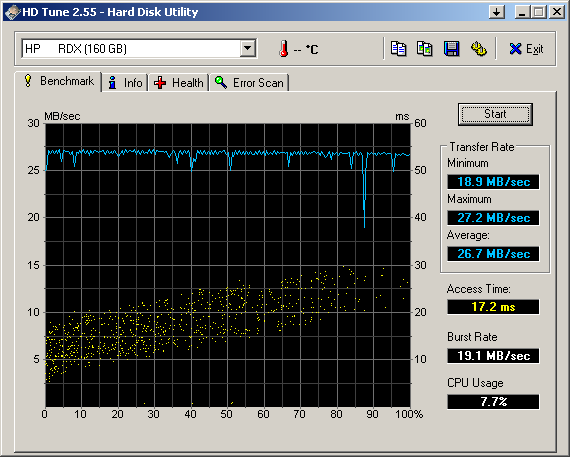 However it looks like the controller in the RDX drive limits the speed to about 42 MB/s. This is only offered as external or internal USB version and is a bit cheaper than RDX. The cartridges have smaller dimensions, so the internal version will also fit into a 3.5″ bay. Another difference is, that not only the ejection works with a motor, but the insertion as well – when you push the cartridge about 3/4 into the bay, it will be automatically pulled in. This system is nearly identical to RDX, except a slightly different shape of the cartridges (which are of course not compatible to RDX). Here you can also get external and internal versions. However, GoVault is more expensive than RDX. Hi, bit of a daft question, but does the cartridge used have to be bigger than the entire drive/partition your backing up or just the used space? I.E a 1TB array with only 200GB used, would that go on a 500GB cartridge or would I need a 1TB? The required size of the RDX cartridge depends on the backup method. In most cases (at least when doing a simple file copy with robocopy or a snapshot with Drive Snapshot or Acronis TrueImage etc.) only the used areas of the source drive are backed up and not the whole drive/partition – so 200 GB of data means a backup of 200 GB (or less when compression of the source data is possible). The only case where you need an RDX cartridge of at at last the same size is when you do a complete sector copy of the partition using dd or similar methods.